I really enjoyed the discussion in the Guardian over the weekend about poor quality trials and pharmaceutical industry techniques that overhype their drugs in an attempt to shift units. Ben Goldacre’s new Bad Pharma book is well worth a read. New reviews about antidepressants come thick and fast and it’s often hard to know what to spend time reading. This meta-analysis jumped out at me because it contains head-to-head comparisons of antidepressants and measures remission and cost-effectiveness, all in a multiple treatment comparison. The research team from the Karolinska Institutet in Stockholm compared the effectiveness and cost-effectiveness of 10 antidepressants used as first-line treatment for moderate to severe depression in primary care. They conducted a thorough search looking for randomised controlled trials in a wide range of databases, by following up reference lists, by contacting pharmaceutical companies and asking for their published and unpublished trial data and by searching clinical trial depositories. They included 895 citations in their screening and selected 87 studies for inclusion in the final meta-analysis. A classic meta-analysis compares two treatments (drug A vs. drug B), but this method works less well when a number of interventions are being compared. The authors used a Bayesian meta-analysis technique known as mixed treatment comparison to combine direct within-trial drug comparisons with indirect evidence from other trials. Placebo controlled trials were not included in the analysis. Instead they focused on head to head trials, which they considered to be the “the gold standard in generating clinical efficacy data”. Remission of symptoms was defined as a 50% decrease on a depression rating scale. The publication claims that no external funding was received to conduct the work. However, two of the authors are employed by drug companies (Innovus and AstraZeneca), although they state that PLoS ONE policies have been adhered to and that no companies have been involved in the work. Ramsberg J, Asseburg C, Henriksson M. Effectiveness and cost-effectiveness of antidepressants in primary care: a multiple treatment comparison meta-analysis and cost-effectiveness model. PLoS One. 2012;7(8):e42003. Epub 2012 Aug 2. Goldacre, B. The drugs don’t work: a modern medical scandal. The Guardian, 21 Sep 2012. Goldacre, B. 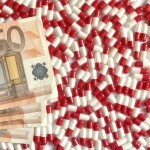 Bad Pharma: How drug companies mislead doctors and harm patients. 2012.